Buttery shortbread filled with chunks of dark chocolate and a touch of fleur de sel. After making two savoury shortbreads on my weekend of shortbread baking madness it was time for some sweet ones starting with the classic plain shortbread which is always a favourite. Next however it was time for something more interesting and I was thinking that a chocolate shortbread would be nice. 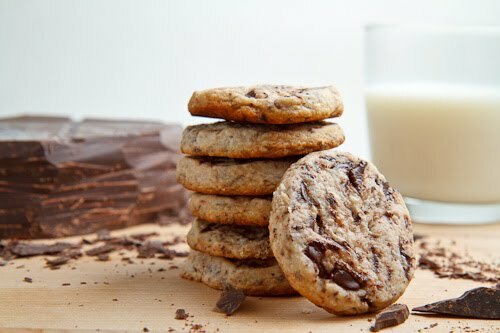 I figured that there were two main ways that chocolate shortbread could be done, either by making them all chocolate of by making them more chocolate chip cookie like and I was immediately taken with the idea of a light coloured shortbread filled with chunks of solid dark chocolate. Of course I opted to use a solid block of dark chocolate rather than chips and I just shaved off small pieces for use in the shortbread. The dark chocolate shortbread would be amazing just like that but I have been into the idea of combining sweet and savoury and the addition of a touch of salt to an otherwise sweet dish can be really amazing so I added some fleur de sel to the shortbread. Mix in the flour, cornstarch and salt. Mix the dry ingredients into the wet ingredients followed by the chocolate. Shape the cookies as you like an place them on a parchment lined baking sheet with an inch of space between them. Place the baking sheet in the fridge and chill for at least 30 minutes. Fabulous cookies, I love that big block of chocolate! These looks so good! Chocolate with some salty goodness! Mmmm. Beautiful cookies! The perfect combo, mmmhhh. I loved your other two shortbreads…but this one's where it's at! Anonymous: I am a big fan of bacon and a bacon shortbread does sound good! My family always makes almond shortbread wedges topped with melted semisweet chocolate and crushed candy canes–might have to switch things up a little and try this recipe. Looks delicious! Happy Holidays! Your sweet and savory shortbreads look amazing. I'm eager to try them all for your New Year's party. I'm thinking these various shortbreads would be a good project for me if I'm snowed in this winter. Keep up the savory ones. They really appeal to me. Love how quick and easy and yummy this recipe is, especially the often missed use of good salt with chocolate = brilliant! But, I would like to see the 30 minute chill time included in the "prep time" listing. It may not be work, but it is time needing to be considered for getting the cookies made. The bacon/peanut butter suggestion is also quite a tempting combination! These look delicious. Can you tell me what the cornstarch does? It seems unusual for a cookie recipe. theconservatory: The cornstarch adds a lightness to the shortbread. If you prefer you can replace it with an equal amount of flour. Man, you're responsible for making me so hungry!!! i want those cookies!! Wow I am getting hungry by just reading this blog. I love chocolate. Great looking cookies. 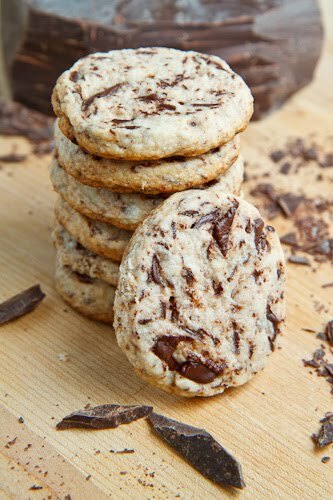 Great cookies, fleur de sel, interesting. YUM! Fantastic cookies – love it! These look fantastic! A great combo of flavors. Beautiful Kevin – such a sophisticated looking shortbread cookie. Happy Holidays and all the best in the new year. They look delicious. Thank you for the recipe. Hope you're doing well, Kevin. Been missing your posts in my News Feed on fb lately. All the best for 2012. Good looking cookies! I hope you had a great Christmas and hope you have a Happy New Year! Fleur de Sel is a type of salt from France. You could easily replace it with some coarse sea salt. These cookies definitely have a shortbread texture with a slightly crispy outside and a melt in your mouth buttery inside. They are not chewy like a chocolate chip cookie. whats up with all that cornstarch Kevin? why? The Dancer in the Dark: The cornstarch makes for shortbread with a lighter and creamier texture but you can replace any or all of it with an equal amount of flour if you prefer. These are wonderful. I had to Google "fleur de sel".French sea salt, that's great. I can buy it at Williams-Sonoma. Going there tomorrow. Keep up with the great recipes. Do you use unsalted butter or regular butter? How about the flour…just regular flour? When you say "shape" the cookies, do you mean they need to be rolled out and cut with a cutter or do you mean scoop out in round balls? If I don't roll them out and cut them, will the round balls flatten as they bake? Thanks! They will not flatten out so you need to roll them and cut them into whatever shape you want. Enjoy!